Apologetics Press - What is a Living Fossil? The definition for the term “living fossil” varies tremendously from source to source. Basically, a living fossil is a living animal that matches fossils that are considered by evolutionists to be extremely old. In many cases these animals were thought to have been extinct for millions of years. For instance, if a Tyrannosaurus Rex were found alive, it would be called a living fossil. The coelacanth fish is probably the most famous of all living fossils. 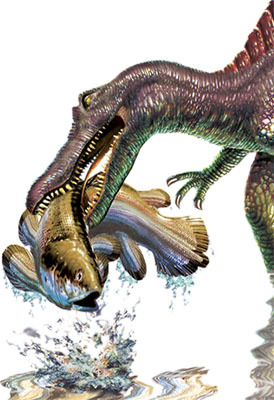 Living fossils pose a number of problems for those who believe in evolution. First, they cast serious suspicion on the way fossils are dated. If an animal’s fossils are thought to be sixty million years old, but then a living one shows up, how could we be sure that the animal has not left a fossil in the last sixty years? Could it be the case that the fossils considered to be sixty million years old are much younger than originally thought? Absolutely. The newest living fossil to be discovered was found in the Coral Sea by a team of French scientists. This small, shrimp-like crustacean, about five inches long and named Neoglyphea neocaledonica, was thought to have been extinct for 60 million years (“‘Living Fossil’...,” 2006). So, with the find of a creature that could be boiled and served at a seafood restaurant for lunch, scientists erased 60 million years of alleged evolutionary history. In reality, this find is the equivalent of discovering a dinosaur. With more of these living fossils popping up every decade, one wonders how long the incorrect paleontological assumptions that fossils are millions of years old can last in the face of such evidence. “‘Living Fossil’ Found in Coral Sea” (2006), The Associated Press, [On-line], URL: http://www.msnbc.msn.com/id/12875772/.